Both hickory shad and blue back herring are in the same family as American shad and follow similar spawning patterns and life cycles. Both of these species are caught during the American shad spawning run using the same tackle and techniques. 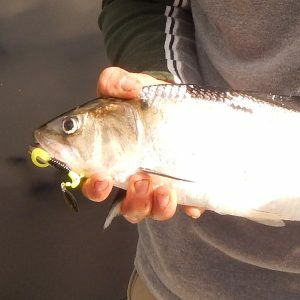 Hickory shad are smaller than American shad, but typically arrive sooner and for their size, fight harder and are more aerobatic. The world record hickory shad was caught on the Econ River and is in the region of the St Johns River we fish.